Latest News: The BSNL has released the hall tickets for the Junior Accounts Officer Exam on its website. The downloading of admit card is available from 30th October 2017. To download the hall ticket, candidates need to make use of the below given link and simple procedure. 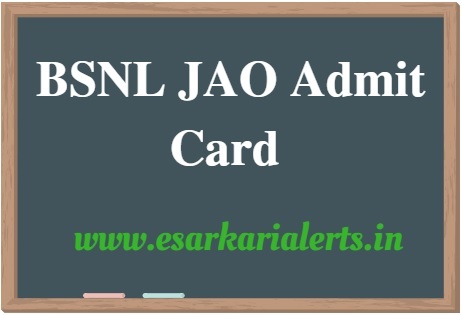 The Bharat Sanchar Nigam Limited has uploaded the BSNL JAO Admit Card 2017 on its authorized web address. The BSNL JAO Exam 2017 will take place on 5th November 2017. As per the resources, many job hunters have applied for this job notification. 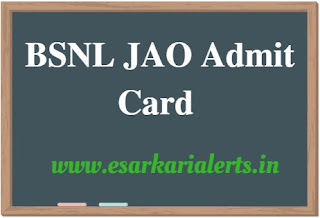 Applicants are now searching about the BSNL Junior Accounts Officer Admit Card on the internet because it is necessary to show the admit card at the time of entry in the examination. If you fail to do the same, your entry in the exam will be restricted by the exam center authority. This examination for the posts of JAO in BSNL will be an online competitive examination. The details about exam center such as name and location will be printed on the candidate’s admit card. As well as, on the admit card, roll number, shift and date of the exam and few important guidelines will be printed. Therefore, this is very important for those contenders. The BSNL is conducting this examination for the hiring of talented persons in the department. There are total 996 vacancies of the Junior Accounts Officer (JAO) on which the appropriate applicants will be recruited. For the assortment of the suitable aspirants, the organization is going to conduct this test. To take part in the exam, applicants must have the BSNL Junior Accounts Officer Hall Ticket 2017 otherwise the official persons will not allow them in the examination center. If you don’t know that how to download the admit card then check out the following method to get your admit card easily. Step #2) Check the section of Advt. No. 10-1/2017. Step #3) Click on admit card link. Step #4) Enter the Registration No., Date of Birth and Password correctly and hit the submit button. Step #5) Take a printout of your admit card. Thanks for reading the article. If you have any question, leave in the comment section.